CACTUS GARDEN BAR its without doubt the only terrace-bar in the city, where result ideal meeting friends or meet new ones enjoying our excellent cocktails and beers. 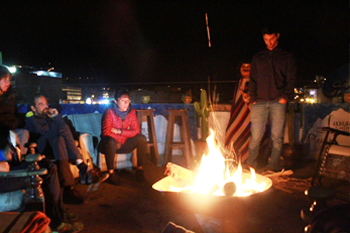 We have confortable sofas, chimenea, games (table ping-pong, darts, giant jenga, playing cards, chess), big screen movies, good view and, the best selection of music: blues, rock, country, chillout, bossanova, andean intrumental and reggae. Do not miss our wide selection of cocktails based on peruvian pisco and, beer lovers will be able to taste of the best brands of crafts and industrial beers. Accompany your drinks with our delicious snacks. Open every day at 16:00 to midnight.